There is an additional $50.00 shipping charge for this item. Max Depth of Cut: 1/8"
So far so good! Awesome product! The stand was a great bonus...really can't use it without a good stand. Easy to put together! Nice sturdy unit! Runs great!!!! The machine arrived safe and sound. I first assembled the stand, which wasn’t difficult. Probably took an hour. The planer itself was mostly assembled with the exception of the turn knob and side tables. The planer attaches to the stand with four bolts. Easy enough! I’ve been using the planer with cutting boards. I am very pleased with the results. It leaves a really smooth surface. I am putting hardwoods through it and the blades are holding up well. The machine is loud so I use earplugs. Overall the machine serves my purposes very well. I can recommend this machine with confidence. Assembly of the stand was fairly easy. The stand is well-designed and sturdy. Some burrs on the edges of several pieces had to be removed with a flat file - a person who does not know to be alert for that sort of issue could be cut. I have only tested the planer but achieved very good results with a good finish at the slower cutting speed. The planer seems to be a good machine at a good price. Runs right out of the box. And runs well! The stand had instruction for assembly written by someone who understands English. It was very easy to assemble. There was a place for every bolt and nut and there were none left over when complete. That's very unusual for a product made in China. It's great heavy duty stand. The planer fits on it exactly as it should and as you see in the pictures. It an exceptional planer for the price and size. I used it initially to plane rough Popular lumber and the results hardly needed sanding. I would buy again. If you have never had a planer before it is hard to for someome to really appreciate this planer. You could not ask for a piece of equipment to come right out of box and be so easy to use . Nearly all my wood is rough cut that I use. Pine, oak, cherry, cedar this machine does a great job. It gives you so much enjoyment to see rough lumber transform into something beautiful and unique. I am a hobbyist and this just adds to the fun. Love this planer. Lots of people said it's very loud, but honestly I haven't had any issues with the sound level, and I'm working in a very small garage. Produces beautiful boards from scrap wood. 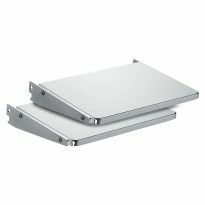 The stand is very useful, easy to move around, strong, and sturdy. 100% recommend. Planer is great ??. BLADES ARE CHEAP DON’T LAST ?? I am impressed with this item. It allowed me to complete multiple projects that I have been stalled on. I didn't think I really needed the stand but now am very happy that I have it. I love this Machine! I just sold a Grizzly 15” planer/moulder to buy this one, as I was not pleased with parts availability and performance of the Grizzly. This is the smoothest planing planer I’ve owned. I’ve owned 3 different planers, and this is by far #1! Rockler had a knockout sale on planer and stand combo, excellent price for what I got! Thank you Rockler! Wish I would have bought this a long time ago! Everything as advertised. Easy to set up and run out of box. Out of the box and within an hour the stand and planner was up and working great. My shop is small so being able to move it around is a plus. Had some very old boards in the shop. Planed a couple and they turned out like new. Great product ! Can not beat it for the money. Does everything its designed to do! The knives that come on this should be replaced immediately. (As in throw them away before first use.) I work with very hard wood (rock maple and walnut are typical) and even the high speed steel knives will give poor results after awhile. I initially blamed the planer, but high quality, carbide knives solved all my problems. Infinity Cutting Tools had a set of knives for $225, gulp, but now this planer does everything I ask of it. It has become my favorite tool in my shop. When Rockler offers this planer with the stand on sale for around $650, I cannot imagine a better deal. I've milled red oak for two king bed frames and many other projects with no problem. Yes, I'd like to own a 15" or 20" planer but I don't. This one does all it is asked to do. It is outstanding! It's what I needed to complete my woodwork shop! This is my first planer so I have nothing to compare it to but the reviews were correct. It is a very nice addition to my hobby. I have been using a delta planer that I inherited from my father-in-law. The poor thing has seen better days. 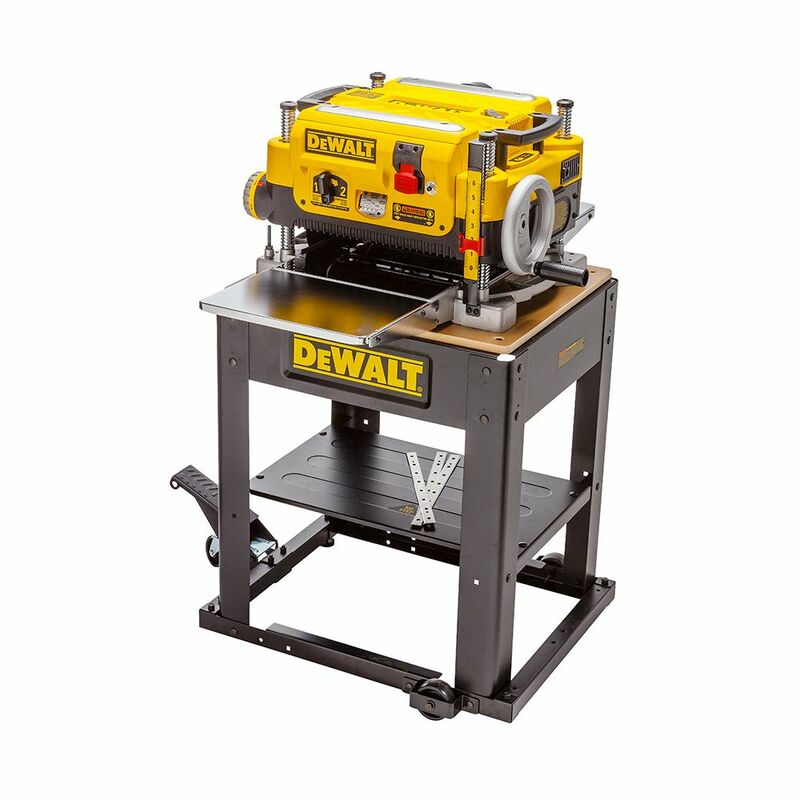 Researching which planer would be the best to replace it with I came up with the dewalt 735X. It does cost a little more than other brands, but the features it has and the ease in blade changing make it worth the cost. Hope this helps. I would recommend it. Awesome, I use it everyday. Only had it a few weeks but it does everything it claims to. 1) You need a shop-vac attached to the blower fan or the wood chips will be discharged at high velocity from the back of the planer's discharge port all over the place. The shop-vac's hose tends to drape over the out-feed table, so it can get in the way or be dislodged from the discharge port. Be aware that your vacuum container can fill up with wood shavings rather quickly and you won't know it. What's the decibel level of your shop-vac? See next problem. 2) The noise level of this planer is atrocious, on the level of a jet engine, at least 120 dB. Add to that the noise from the shop-vac and you have hearing-damaging sound levels in the 150 dB range. I needed to use both ear plugs and muffs to make this tolerable. The noise does not increase much while planing. If you do not use hearing protection, plan on getting permanent hearing damage and requiring those $5000 hearing aids! Fort your hearing safety, do not turn this on without using hearing protection. 3) The electrical cord is fairly short and comes out of the left side, back of the planer. This can effect placement within your shop without using an extension cord. This machine uses nearly all of its 15 amps, so if you need an extension cord, you will want to obtain a hefty one. Really like this little jewel. Can’t give it 5 stars because of the sniping. I have run well over 400ft of 2x12x8 and it never missed a beat. The planer has performed very well. I hesitate to give it a higher rating until I have used it more. I think the stand is a must as it is very heavy to be putting on a shelf and taking it down. The stand went together easily and makes the planer very portable. 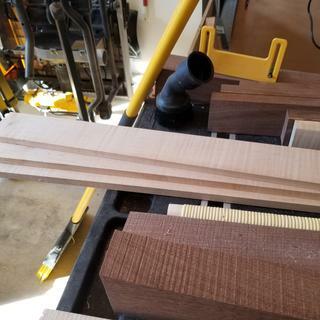 Planer works great. Adjustments make it very easy to get consistent results. Would get a 5 star rating if it came with a chip/dust collector. It is a good tool, and I was pretty happy with its performance. Suddenly started to make earsplitting noise. I opened it up and found the fan in the chip ejector system is made of plastic and some of the blades were gone. I spoke with the service center who said it was $300 to touch the machine, plus parts, and I had to get it there ( 200 miles). A shame that such a piece of equipment like this intended to be portable could have such cheap parts. Looks like just what I need! we've wanted one for some time now and this was a great deal. I purchased this to thickness parts for boatbuilding. Excellent shop addition. Hoping to make coffee tables in the near future. Reputation and reviews by woodworkers and woodworker’s magazines and best sale price currently available. I already have this planer, but I needed a second one for when one is out of service for maintenance. I love this planer — it does a good job with all of the diversity involved in my wood working projects. I don’t like to have any down time—thus, a second unit in my shop. 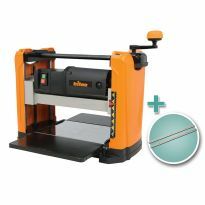 I heard that this is the best planer in this price range. For the regular price you get the mobil cart which is usually $179.00. 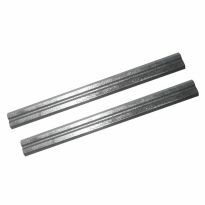 A great price for a quality plainer for a small shop. A proven tool at a good price. The stand is a great bonus. Great deal with the Stand, Tables and extra Knives. Great quality, good price, and every shop needs a good planer. This is a gift for my son. I have had this same planner since 2012 and it's my favorite piece in my hobby shop. I purchased this to take advantage of the holiday offer. I trust Rockler. Highly rated planer. Good price when coupled with the DeWalt stand. This was a great deal that I couldn't pass up! 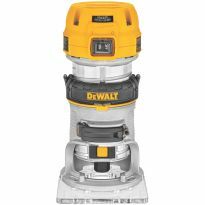 I'm a big DeWalt fan and have been looking for a planer for a long time. Rockler had a great sale that included the stand for free! Good reviews on product and pricing. I have been looking at this model for some time now. Good price with the included stand. Best results, excellent value for your dollar. Sale Price! Been looking for a deal on this planer and this is by far the best one I have seen. After checking all reviews and utube videos, this was the best planer. Also, your price was the lowest I found. Reviews seen on YouTube by various users. Needed for future project and my research identified this as a good deal and excellent product. BEST TOOL FOR THE PRICE AND THE USE I NEED IT FOR. Great package deal for a top rated planer. Good Price with the free table. Upcharging for shipping when it says free shipping is problematic. 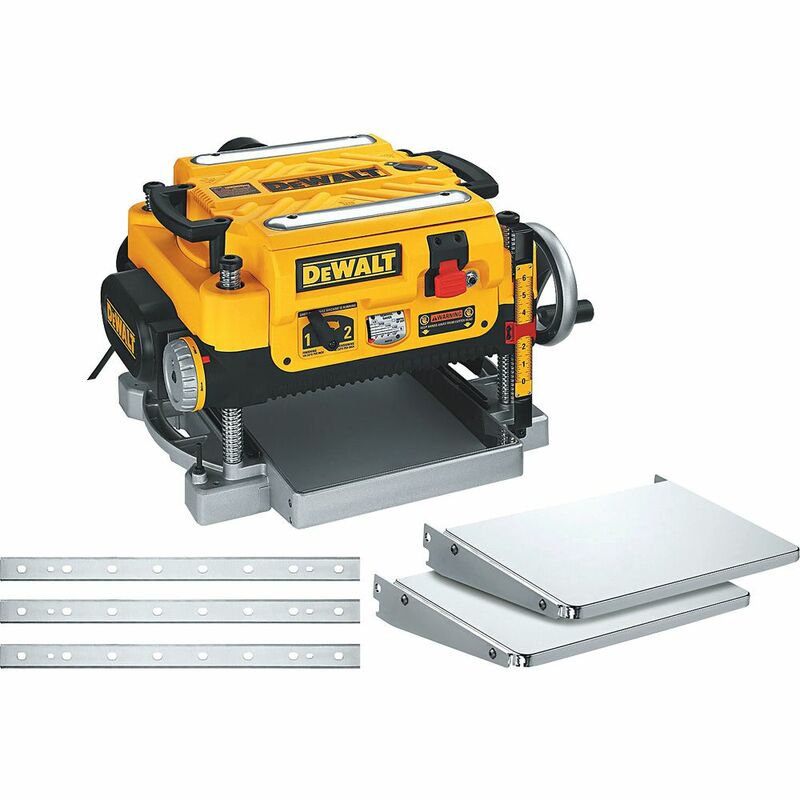 Does the stand for the Dewalt planer come separate. In other words, can I buy just the stand? BEST ANSWER: Rockler Item Number 21153. How tall, wide and deep is complete unit including the base? BEST ANSWER: Sorry I can't give you an exact answer as we're away from home for a while. I will tell you that I had to build a box to bring the height of the planer table to the height of an out feed counter that doubles as my miter saw table. The box adds about 6 or 8" to the stand and the counter is about 35" in height, so I'm guessing the stand is less than 30" in height. Sorry I can't recall exact dimensions. 44 inch high(planer on stand) by 27 inch wide (planer to end of height adjust handle) and 29 inch deep with the front tray up and the rear tray down (cannot put up all the way due to interference with the chip outlet). BEST ANSWER: Yes the SW735X runs on 110/115 V AC with a 15 amp draw. I run mine on a 15 amp circuit and have to watch the chip load as it does kick out the breaker from time to time. Try to set this up on a dedicated 20 amp circuit and you should be fine. I use a dust collection system with 1100 cfm, a 4" dia piping, and a .5 micron canister to evacuate the chips and minimize the volume of wood dust created in the shop. A secondary air cleaner is also used to capture other ambient wood dust. Make sure to use ear protection when operating this planer. As I see this ad, the extra blades, the in feed & out feed tables, and the stand come with this planer 735x. Is this correct? Each retailer has their own product packaging options. For example, just the planer is sold, another retailer combines accessories like knives and tables. This ad that you refer to combines the knives, tables, and stand with the planer. I bought this package and couldn't be more happy. You are correct and wise to ask. Does it come with the mobile base? BEST ANSWER: The stand, as shown, is movable. It has two wheels on each side and a wheel on one cross bar that is retractable with a foot step. I have only reu mine at the slower speed and have found it to do an excellent job. The price included the base. 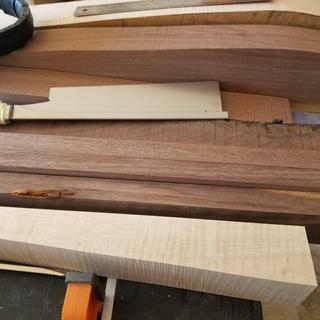 However, I have seen the planer offered without the base. The base has wheels attached. 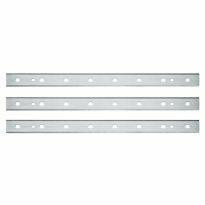 How easy is it to get proper alignment when changing out blades? BEST ANSWER: No problems at all. They are self aligning.It's well designed. Changing the blades is simple and they align automatically. I haven't needed to change the blades, but the manual states that they are self aligning. you can not go wrong. the blades have a dowel at each end to keep in line. 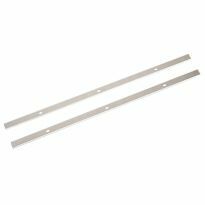 Does the Folding Tables come with the Hardware Kit to install them? If so, the Hardware Kit was not included with the unit I purchased. 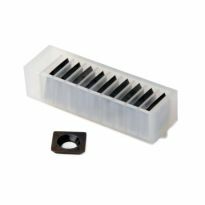 BEST ANSWER: I remember when I purchased and set up my planer that the instructions called for bolts and springs and whatnot, but I found that the extension tables did not actually need any of that to be installed. They were instead held in place by depressing a spring-loaded pin of sorts that was already captured on the planer bed and simply snapped into place. Then you ensure they are level and flush with the planer bed by inserting a long straightedge through the planer and adjusting as required. They snap in by the 2 spring loaded "knob" looking pins on either side of the folding table extensions. These were not included on the folding tables I received!! Mine had everything required for mounting. The picture shows this deal includes the mobile base. Is that true or is the base included only the fixed base? BEST ANSWER: Gary it is a mobile base. I have a small shop and being able to move the planer when I am not using it, which is not that often anymore, is great. It is a great planer and it is probably the second most used machine in my shop. I got the stand with mine. It’s not the best mobile one since it has on 3 wheels. The single big wheel lifts the stand and allows it to be moved. But it is mobile for what’s its worth. The base is mobile and rolls easily when needed. It works well as does the planer. Everything in the picture is included. I received the mobile base. Does this model have a dust collection port? BEST ANSWER: You really must use the discharge port. It has an adapter for 4" and 2.5". Not using it means that the chips will be blown out at high velocity and into your shop creating a real mess. Using it means that your shop-vac's hose will drape over the out-feed table and potentially get in the way or be pushed out of its connection. Using the shop-vac means that you need access to another electrical connection nearby. The shop-vac can fill up rather quickly or become clogged. You need some SERIOUS hearing protection when using this planer, even more so when using it with a shop-vac. Do not even start this machine without hearing protection! Yes. But it is unfortunately made of plastic, and therefore broke. Yes is does on the output side above where the wood comes out. Yes, if has a 4" port on the discharge side. Yes, a 2 1/2" with the included adapter. The stand is 24” wide, 21” deep and 30” high. Thanks Gerald. But now I’m confused. I found the Rockler item number for the stand on their website. They indicate the dimensions are 21”W x 27”L x 29 1/2”H. I realize the differences are minor but I’m trying to squeeze this into my already crowded garage/workshop. I think it will fit and that’s the bottom line. Thanks again! Thank you David. It looks like it is going to fit in my shop. The max depth is 1/8; what is the minimal thickness? BEST ANSWER: It will adjust to anything from 0"-1/8" by spinning the knob on the right side of the unit. Great planer, easy to use and a good size. The depth scale goes from 0 to 6". 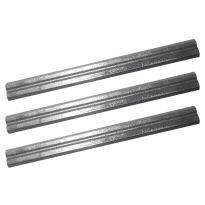 Personally, I've planed down to 3/32" a few times with minimal issue. It will plane your wood down to just over 1/8"
BEST ANSWER: I don’t know. It easily handles all the hard woods I use. Changing the knives is very straightforward and easy. I do have to run it on a circuit by itself. I am happy with it and highly recommend it. The motor is rated at 15 amps which translates to roughly 1 1/2 hp.at full load. Hello Can It run on 220 vault? BEST ANSWER: Mine came wired for 110 volt. Power tool companies normally include capabilities of alternative hookups in their specs sheets and this one doesn't. This planer seems to have plenty of power operating on 110v. No, it’s wired for 110. Has plenty of power, not sure you need 220. Width of table 24" width of table foot print 24"
Width of planer base 20 1/2"